Directed by Alysa Golden, Top Girls takes us into the world of six women from different countries, time periods, and positions in society, and we learn about their struggles, accomplishments and values. Their stories are vivid and have many parallels with today’s challenges. Marlene (Alison Dowling) is the central figure. She’s a modern-day, corporate ladder-climbing woman around whom the story revolves. Her fantastical dinner party is attended by her female icons. One of her guests is Lady Nijo (Tea Nguyen), a 13th century Japanese figure who at age 14 becomes a concubine to an emperor. Wrapped in a stunning kimono, she is eye-catching and elegant, and she proudly owns her beauty and seductiveness. As she speaks of her babies, Nguyen makes her melancholy strong and memorable. Gret (Jordi O’Dael), a 16th figure of Flemish folklore who was painted by Bruegel, is the dinner guest who gets the laughs. Also wonderfully dressed by Bec Brownstone, this peasant wears a large apron that has pockets large enough to sneak in several pieces of bread. O’Dael must presumably start work on an empty stomach since she eats and steals food without stop, much to the audience’s delight. Also present is Isabella Bird (Lisa Lenihan), a 15th century British explorer and naturalist and the first woman to be elected Fellow of the Royal Geographical Society. Lenihan plays her in a stern and serious manner, but we see her vulnerability when her many bouts of illness and her longing to see her sister Hennie are mentioned. Griselda (Jennifer Fahy) has the most cruel story of having to prove her loyalty to her Marquis husband by giving up her babies, later to discover they are alive. Lastly, Pope Joan (Charlotte Ferrarei) reveals her struggles behind being the first woman Pope, which include giving birth during a procession. These women’s stories are told in what the director describes in the program as a “frenzy of overlapping conversation.” That’s exactly it. The characters cut each other off with intention, not as acting mishaps, so there were many moments during which two actors spoke at once. Unfortunately the systematic interruptions made it hard for me to follow the conversations. Fortunately the present-day stories are told by actors who speak one at a time. When we see Marlene at work and then at her sister’s home, there is renewed energy and interest. Notably, the office scene in which Louise (Peta Mary Bailey) has a job interview is quite powerful. She is an employee who has more than paid her dues, yet is bypassed by male colleagues. Bailey is formidable and bitter. Also, the candidate Shona (April Rebecca) is wonderfully perky and naive. At the home of Marlene’s sister, Joyce (Nyiri Karakas), we meet Angie (Rebekah Reuben). She is a confused teen who is stuck in the countryside and who longs to be with cool Auntie Marlene. Reuben plays her with much poignancy. And Karakas also does a great job of being the hardened and joyless Joyce, burdened with guarding Marlene’s family secret. 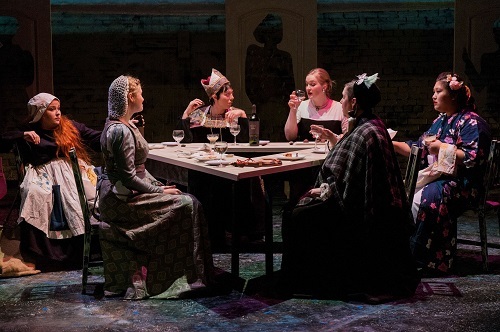 Top Girls is strengthened by fine acting, mixed period costumes and a simple set that makes clever use of doors. Also, Estella Haensel’s whimsical dancing ties the scenes together. Top Girls is a timely important work that brings women’s voices to the forefront. Purchase online, or e-mail reservations@alumnaetheatre.com or phone 416-364-4170 Box 1 to reserve seats and pay cash at the door. Box Office does not accept credit or debit cards for in-person sales. Previous PostReview: In the Next Room (RedWit Theatre)Next PostPlaylistings for the Week of January 21st, 2019.